Flat widescreen monitors? Glowing keyboards and mice? Controllers with analog thumbsticks? The late ‘90s PC gamer needed not such things. Or at least we didn’t know we needed them, as they either didn’t exist or weren’t widely available yet. No, as Redditor SuperBabyHix’s retro setup demonstrates, all we needed was a keyboard that worked, a basic mouse, a cheap-looking gamepad or bulky joystick (a sweet CH Flightstick Pro in this case) and a monitor that was at least 85 percent internal components. 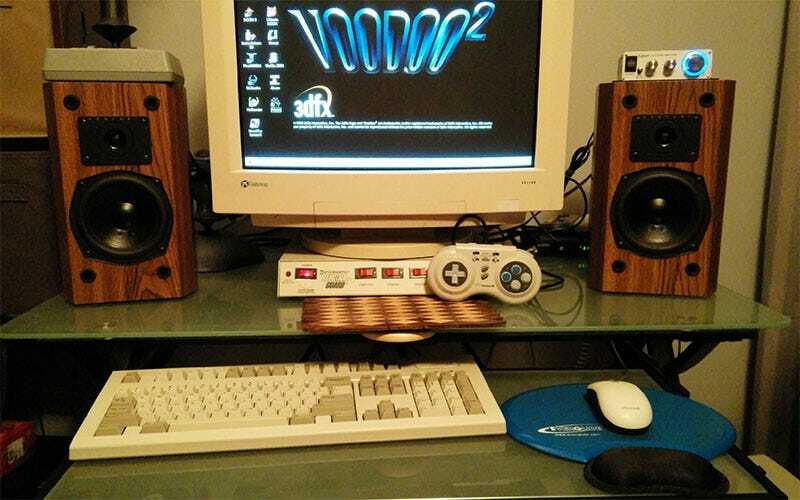 The rest we spent on cutting-edge video cards, the best Sound Blaster we could afford and some speakers to match. It’s not completely period accurate. As the OP points out the amplifier for his speakers is new (the old one was too big and bulky) and the Geforce MX400 card used is a 2000’s thing, but otherwise it’s perfect. Remember back when 3D cards were just 3D cards and you still needed a 2D card to handle 2D graphics? We were so stupid back then.